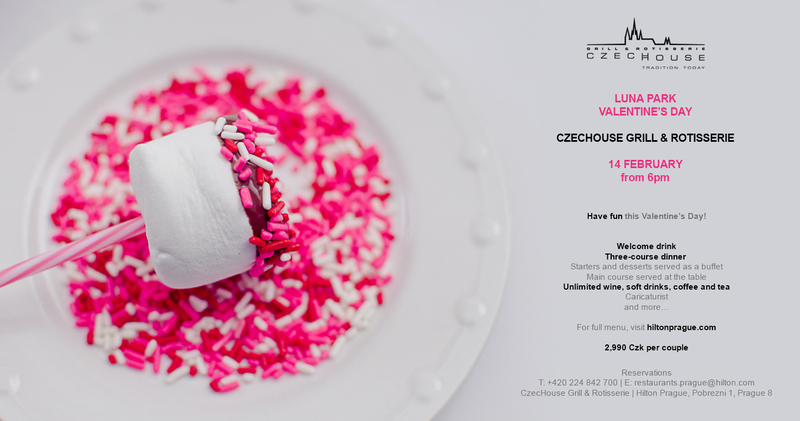 Light up your loved one´s life this Valentine´s day in a pleasant ambiance of CzecHouse Grill & Rotisserie at Hilton Prague. Treat your loved one to a delicious dinner and rejoice in our buffet, served main course, enticing dessert buffet and a charming Luna park atmosphere with love pop songs, candies and a caricaturist. Enjoy grilled octopus, portobello mushroom muffins, prawns or a rainbow trout from the seafood corner, delicious red velvet cupcakes, chocolate dipped strawberry pops and much more… Price also includes a welcome drink, unlimited consumption of hand selected wine, soft drinks and coffee & tea.